Just the thought of Justin Bieber and his fever make me cringe, but let’s face it…he has one hell of a tribe. You either love him or can’t stand him. As a fan (granted they are mostly tweens and teenage girls, and a few of my male friends – you know who you are!) you anxiously await his next song or piece of merchandise and hang on his every word. Wouldn’t it be cool if you and your business had the same effect? When creating your content online here are 4 simple steps you can do to start creating your own tribe. People are passionate about those who take a stand and those who speak their mind. People follow people who make them feel something! Stirring emotion in someone, whether it is to inspire, teach or question why they are doing something a certain way is powerful. And it can create enemies or online trolls who just can’t help but write negative things. As my friend Bri Clark (of Belle Consulting) said recently, “I’m famous on LinkedIn! I have a troll!” Consider it a compliment when you rub someone the wrong way because you will have many more who love what you are saying in the way you are saying it. Be the brave one who says what others are only thinking and you will give people a reason to not only follow you, but stand up for you. Sure “modelling” what someone else does is fine as long as that means using their structure, plan or ideas and then making them your own. Let’s face it, most ideas out there now are borrowed or repackaged. Blatant copying though means you are NOT being yourself. Integrity is one of the biggest buzz words out there right now! It is because so many people want to be brave enough to be themselves online, in business and in life but are scared to for fear of what others may think. If you are creating content and thinking about “what would so and so do” as you write it or film it chances are you are too concerned with trying to be someone else. Delivering content online is not about long movies or novel sized posts. Have a chat with your audience as though you are talking to your best mate or a colleague you have known for a while. Great conversations make you laugh, smile or realise something new about yourself. They are also an excerise in building rapport and getting to know someone more. In all good conversations personal details come out about yourself. Personal info makes people feel closer to you and want to know more. Did I mention it is the day after Christmas as I write this and I am still stuffed from this amazing Jamie Oliver pie that took me 5 hours to make last night? Jamie, by the way, is another guy who has nailed the concept of building a tribe. On a more technical note, the second we started sending shorter emails using a more conversational approach our open rates have dramatically increased. It can be as simple as blog comments, using Facebook on a consistent basis, holding ongoing webinars or reading user comments on your online videos and asking for more that you can share next time. Or you can provide a membership site or a mastermind group to monetize what you do. As you build a fan base they will want to interact not only with you, but with each other, so be thinking of a way to make that happen. In this brilliant podcast “Building a Tribe with Dan Andrews“, Dan said one of his most valuable lessons he learned in university was “Don’t take classes, take professors“. There are probably hundreds, if not thousands, of people already teaching what you teach or providing the same services. THERE IS NOT ANOTHER YOU! You are the reason people will choose to engage further. Remember, a business can have a tribe too…think Steve Jobs. Have you heard my podcast? You might also like this! 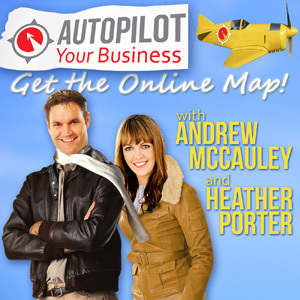 Autopilot Your Business is a hub of resources to help you automate your small business online.